It’s a far different Waikiki that surfing pioneer Duke Kahanamoku oversees now, and hopefully, he would be pleased. The famous spokesman of the surf, whose statue borders the beach, would see that the last remains of a rustic Waikiki are long gone. But he might also observe that the more gimmicky, down-market aspects of Hawaii’s top destination have been largely dismissed, as a wave of change sweeps down Kalakaua Avenue and through the rest of Waikiki. Presumably, he would be happy to see that this transformed destination provides a more polished setting for those things that represent Hawaiian culture. And Duke still has pride of place at the southern end of the beach. His tall likeness with outstretched arms still stares inland in a sign of welcome to the famous strand. “There is a new generation of visitors coming, and all the changes here have brought a new life to Waikiki,” said Monica Salter, the VP of corporate communications for Outrigger Enterprises Group. She pointed to the innovative Waikiki Beach Walk open air mall and entertainment venue as one of those key developments. But just a short stroll from the Beach Walk is one of the most obvious manifestations of the Waikiki renaissance for visitors. 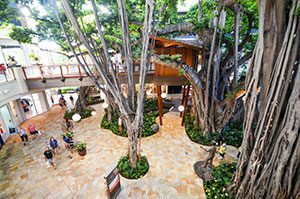 The International Marketplace on Kalakaua Avenue was once a rather murky, claustrophobic collection of souvenir and gift stores, anchored by a wonderful banyan tree with giant outstretched branches in the middle. The banyan tree is still there, and the market remains open to the air, but the presentation has now entirely changed to a much more upscale, but still-welcoming experience. It retains a connection to its origins and pays homage to its history, says Salter. The next-generation International Marketplace was opened in 2016, with over 100 locations for a top shopping, dining and entertainment on three meandering levels. It features a “curated mix of upscale and lifestyle brands,” and the first Saks Fifth Avenue in Hawaii. Other brands include Burberry, Swarovski, Fabletics, Billabong, Abercrombie & Fitch, and Banana Republic. Located next door, and opened earlier this year, is the new Maui Brewing Co. Waikiki. It has a level-two location at the Holiday Inn Resort Waikiki Beachcomber and features open air decks that face out onto Kalakaua Avenue. The Maui Brewing Co. is a sociable brew pub that is a great place to meet friends, sample award-winning craft beers and watch the nightly parade of visitors below. It’s also a preferred spot to gather before walking across the street to the Outrigger Waikiki Beach Resort, which houses the outstanding Blue Note performance bar. It’s been open for just two years, but the Blue Note has quickly established itself as Hawaii’s leading concert bar venue for live performances, known for hosting leading jazz, rock and blues artists, including island artists. The venue seats over 300 patrons. After a few days and nights filled with activities like this, your chosen place of rest becomes an increasingly vital oasis. Hotels that back directly onto the beach still have preferred status, but Waikiki is so compact and walkable that even those hotels that don’t have beachfront locations are usually just steps away from the sand. In any case, the generous supply of hotel rooms in Waikiki is helping to flatten hotel rates, at least in comparison to the rest of Hawaii. Visitor demand for rooms has outpaced supply in all the Hawaiian islands except Oahu, says a market measurement company. The push to increase the hotel room inventory in Waikiki has served to keep ADRs (average daily rates) on Oahu level at US$233, as compared to US$349 for Maui county, says Duane Vinson, the VP of STR Share, a market sector measurement company. “There is lots of new supply in Waikiki, so there are some challenges to increasing the growth of the ADRs and occupancy,” he says. The overall room supply across the state of Hawaii is up 3.1% this year over last, but the supply in Waikiki has jumped by 18% in the same period, he said. Beachfront at the Royal Hawaiian Resort. 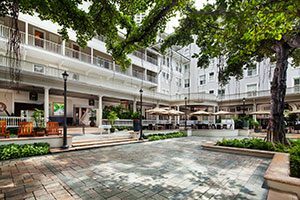 While the cooperative evolution of the hotel inventory in Waikiki has been rapid in some cases, the historic properties there have maintained a more stately pace. One of the oldest hotels in Waikiki, and probably the most regal, is the Royal Hawaiian Resort, which is celebrating its 90th anniversary this year. Only the Moana Surfrider is older, and both are under the Starwood Hotels & Resorts umbrella – the Moana Surfrider is a Westin Resort & Spa, and the Royal Hawaiian is by The Luxury Collection. Just a short drive outside of Waikiki is the elegant Kahala Hotel & Resort, which celebrated its 54th birthday this year. This understated refuge on the south side of Diamond Head gives guests a break from the hustle and bustle of Waikiki. In September, it was the title sponsor of the Hawaii Invitational polo tournament, and in November, it has hosted the Hawaii Food & Wine Festival. Six dolphins are in residence as part of the Dolphin Quest attraction. Another Hawaiian hotelier with a long history in Waikiki is Outrigger Enterprises Group, which has seven properties in the famous beach region. Outrigger is celebrating its 70-year anniversary this year, while the flagship Outrigger Waikiki Beach has marked 50 years of welcoming visitors from around the globe in 2017. 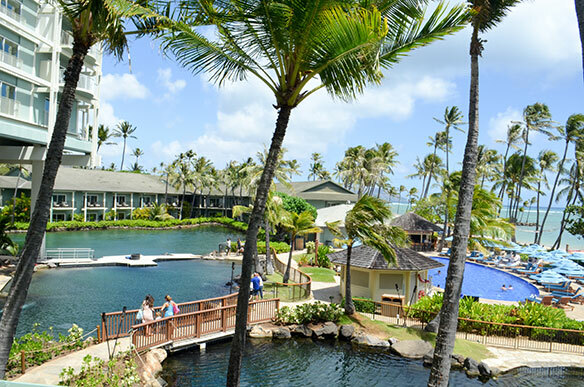 The resort’s prime location is the original home of Outrigger Canoe Club, which served as the inspiration for the company’s name. The recent opening of the Reef Bar & Market Grill is the big news at the Outrigger Reef Waikiki Beach Resort. Located right on Waikiki Beach, the Reef Bar & Market Grill offers casual all-day dining modelled after authentic local island meat and fish markets. Guests select fresh “farm-to-beach” ingredients and grill their own steaks beachside. After just a year-plus in business, the Surfjack Hotel & Swim Club by Aqua-Aston Hospitality in Waikiki has earned accolades for its stylish digs. It has, for instance, collaborated with local artisans to source handcrafted furnishings, while local artworks are featured in the 112 rooms. The onsite Swim Club features a DJ that spins vinyl near the pool. The hotel’s style is dubbed “modern Aloha,” and is just a short stroll from Waikiki Beach. Meanwhile, Aqua-Aston’s Ewa Hotel in the heart of Waikiki is now undergoing a major redesign, which is set for completion in fall 2018. When it’s done, it will reflect a 1970s-style aesthetic with skateboards as the focal point. The refreshed property will feature a beer garden, food truck rallies, upscale dorms and communal spaces, and an outdoor lanai with great views of Waikiki. Now nearing completion is the transformation of the Pacific Beach Hotel into a new oasis in Waikiki, to be renamed the Alohilani Resort Waikiki Beach. Phase 3, set for completion in late 2017, will include a destination pool deck with cabanas, a saltwater infinity pool, a new bar, fitness center and spa, and retail corridor. Two Iron Chef Morimoto dining concepts will be opened in Q1 of 2018. Also reimagined will be the giant saltwater Oceanarium in the lobby. Other hotel projects are in the works for Waikiki. 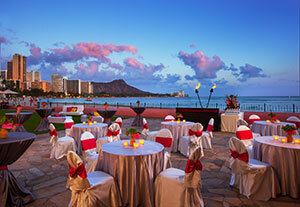 For example, a revitalization of the Outrigger Reef Waikiki Beach Resort is now in the planning stage. A phased approach for this revitalization will add 200 rooms. Also, the Mandarin Oriental Honolulu, which will have 125 rooms, is on the horizon with a debut set for January 2020. The independent Mana’olana Place, with 125 rooms, has goal of opening in December 2020. And there is no stated opening date for the Hyatt Coco Palms, with 350 rooms. But in the end, all the new glitz and glamour of present- day Waikiki would be nowhere without the iconic beach that started it all. 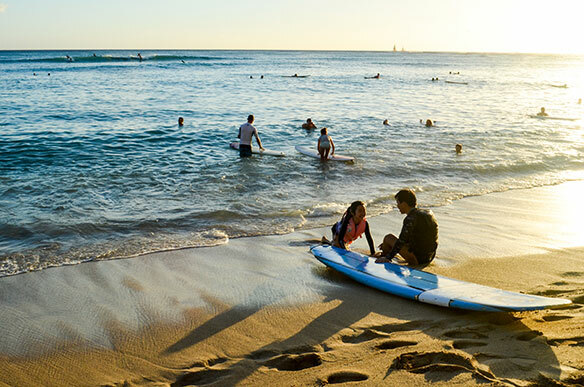 Waikiki Beach is still a perfectly shaped crescent composed of silky white sand, washed with rustling waves that are ideally shaped for novice surfers – and with that unmistakable backdrop of Diamond Head mountain.